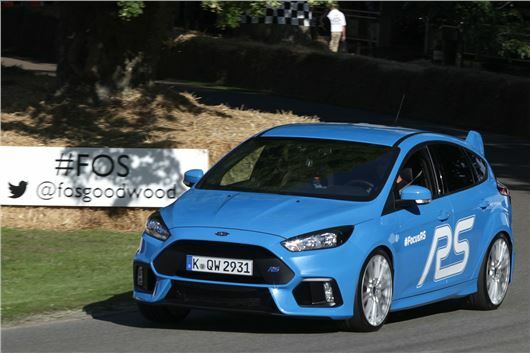 Ford announced last night that its new 2.3 litre 350PS all wheel drive Focus RS would go on sale from £28,940. The car gets from 0-60 in 4.5 seconds and tops out at 165mph, eclipsing the new Honda Civic Type R.
The all-new Focus RS optimises acceleration by introducing Launch Control technology to a Ford RS model for the first time. The model also debuts new Ford Performance All-Wheel Drive with Dynamic Torque Vectoring, for outstanding traction and grip with unmatched agility and cornering speed. Focus RS drivers can select four different Drive Modes that configure the AWD system, damper controls, Electronic Stability Control, steering and engine responses, and exhaust sound to deliver optimum performance in road or circuit driving conditions. Normal, Sport or Track settings are available, alongside a special Drift Mode to help the driver achieve controlled oversteer drifts under circuit conditions. UK and European deliveries from early 2016.